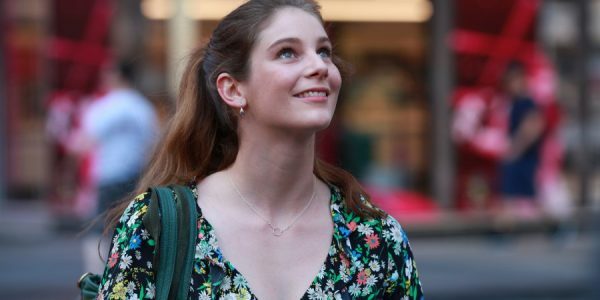 "True beauty is in the imperfections"
The mere mention of the release of Dance Academy: The Movie may cause two key responses in those looking to spend their entertainment dollar this weekend. Firstly, excitement from the fans of the television drama who will get to see what happened in the next chapter in the dancers lives. The other response may be one of confusion from those who have never watched the television show. Even though both of these responses may be justified, this is a film that may prove to be a surprisingly entertaining option for both audiences. Audiences old and new are introduced to Tara Webster (Xenia Goodwin) who had the world at her toe-shoed ballet feet until an accident caused her dreams of touring with the National Ballet Troupe to go beyond her reach. Through months of rehabilitation and supported by the love of her boyfriend Christian (Jordan Rodrigues), she has been able to get her life back on track and looking to another future. Then through a chance meeting with Madeline Moncur (Miranda Otto) who is the new director of the ballet company, Tara begins to consider going back to a life of dance. Even with the opposition of Christian and her friends, she moves to New York to find her break into the dancing community. After living through the hard knocks of life on the dance floor, she manages to find her break by partnering with her former classmate Ben (Thomas Lacey) in a dancing competition. Eventually, Tara has to come to terms with what she is willing to sacrifice for the sake of her love of dance and her love of her friends. Television shows adapted to the big screen have had varying degrees of success. The expectation is that Dance Academy will only appeal to the fan base of the Australian teen dance soap opera, but it does have more to offer. For the fans, it provides the next chapter of some of the central characters of the series. Most are still dancing in various forms, but they have moved into the young adult stage of life. Which shows that even with all of their talents, life has a way of dealing difficult blows and the cast needs to learn how to adapt and grow in the process. For those who are new to this dance troupe and the lives that have unfolded on the small screen, award-winning television turned feature film director Jeffrey Walker provides an entertaining offering for the young adult market. He manages to balance the established personas of the characters but makes them accessible for a new audience. Providing some great images of Sydney and showing that talent can come from other sources outside of the United States, Walker cuts a fine line between a made-for-television film and a burgeoning young adult franchise, but outside of the predictable conclusion it falls more in the category of the later. Not to be misunderstood as a great drama, the makers of Dance Academy: The Movie sit in the reality of what they are delivering. A dance drama with an ensemble cast that will satisfy those who keep Friends on auto-repeat at home. The cast, writing and direction manage to stay clear of cringe-worthy dialogue and provide a satisfactory new season for these two-dimensional characters. It is unlikely to break box-office records, but it is refreshing to see a young-adult drama that is not set in a dystopian universe. Destined for a resurgence of the series and direct to streaming audiences around the world.